Gain visibility and ensure security compliance over your cloud workloads. Barracuda Cloud Security Guardian is an agentless SaaS service that helps organizations stay secure while building applications in and moving workloads to the public Cloud. It provides end to end visibility of your security posture in your public cloud deployment by ensuring continuous compliance and automated remediation of security controls so that you can better understand and reduce your risk posture. 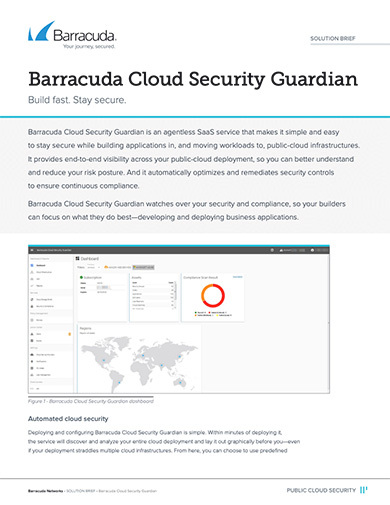 Barracuda Cloud Security Guardian watches over your security and compliance, so your builders can focus on what they do best – building your business applications. Barracuda Cloud Security Guardian provides you with visualization of your cloud assets and their inter-relationships from network, application and access perspectives effortlessly providing you with valuable insights. Maintaining compliance across your cloud environment can be challenging. Your developers move fast to bring new services and applications online and burdening them with maintaining compliance with security frameworks such as PCI, CIS, NIST HIPPA, will only serve to slow them down. Barracuda Cloud security Guardian installs in minutes and scans your entire cloud infrastructure for vulnerabilities. Using pre-defined or custom profiles, you can quickly remediate and maintain continuous compliance by leaving your builders to do what they do best – Build fast! Latent threats and malware can have devastating effects on any business. Barracuda’s Advanced Threat Protection (ATP) automatically scans the contents of your AWS S3 buckets or Azure Blob storage, then identifies and removes any latent threats. When ATP is enabled on Barracuda’s Cloud Generation WAF or Cloud Generation Firewall, it works to stop any and all inbound threats from making their way into your infrastructure protecting your most valued asset – your business. Ensuring that you maintain the correct rights and privileges to cloud services across environments can be challenging when your builders move fast. Should a resource change and deviate into non-compliance, Barracuda Cloud Security Guardian will automatically alert, remediate and present activity reports for that user while quarantining the user or application from making any further changes that affect your security posture. Today, attackers move fast by automating the exploitation of misconfigured resources, and your public cloud environment is no exception. Barracuda Cloud Security Guardian polices the management plane and the data plane, fixing vulnerabilities by instrumenting / configuring native controls and by deploying our market leading Cloud Generation WAF or Cloud Generation Firewalls as and where needed. Barracuda Cloud Security Guardian is an agentless SaaS service that makes it simple and easy to stay secure while building applications in, and moving workloads to, public-cloud infrastructures. It provides end-to-end visibility of your security posture in your public-cloud deployment and ensures continuous compliance and automated remediation of security controls so that you can better understand and reduce your risk posture. Interested in this product? Let's get in touch.